The Magic Hutch: Here We Go Again! It's hard to believe, but 2013's Holiday Season is about to end. Tomorrow night at midnight we'll be toasting in a New Year and the chaos of Christmas shopping, decorating and entertaining will be a fading memory. What won't be so easily forgotten are the good times that were shared during this holiday and the joy that spending time with family and friends can bring. As a New Year begins, it also becomes a time when we look at the empty slate of the next year, and relish in the thought of new beginnings. In our family, there will be a new granddaughter in April, a new "niece-in-law" in June, a planned trip to Europe, an exciting political race in a local election for my husband and all the ups and downs in a family's life when there are four daughters, four sons-in-law, five granddaughters and two grandsons! There will be the ever-present resolutions (more exercise, less calories, more home organization, less "sweating the small stuff"!). There is something that is comforting about the constancy of this time of year; even in the face of so many unknowns yet to come. So, this table celebrates our final holiday of 2013. Out come the silver and crystal to say, "HAPPY NEW YEAR TO ALL!" 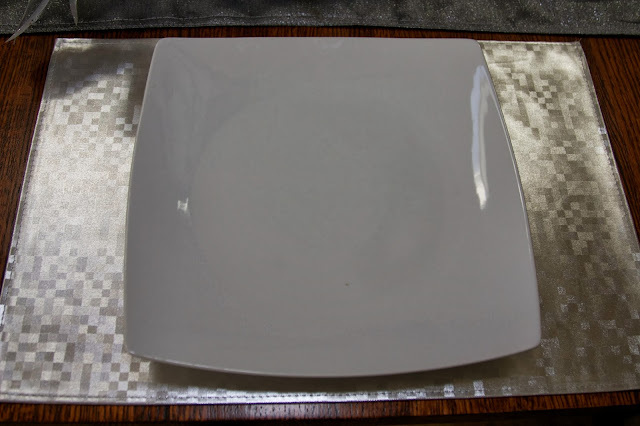 I started with a silver placemat found at Ross on the clearance table! I added one of my daughter's new plates she got at Home Goods. It is labeled Gibson Home. This was topped with salad plates I gave her for Christmas (also from Home Goods) and labeled Grace's Teaware. To remind us this celebration is about TIME, I borrowed an idea from the website, "Creatively Sam's", posted on 12/17/13. 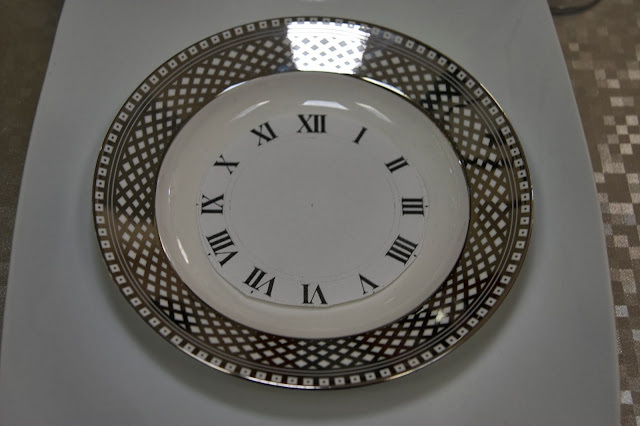 I copied a clock face from Google and placed it atop the salad dish. I opted to leave off the hands because I wanted everyone to pick their own special hour about which to reminisce. I finished the stack with crystal sherbet dishes that were given to us at our wedding. This is the place setting, accented with my Mikasa flatware and Waterford champagne flutes that my husband has bought me over the years as Christmas gifts. 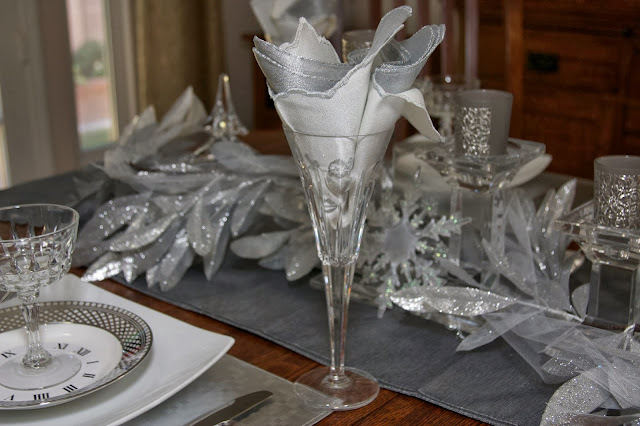 I wanted some height to the table, so I placed inside the flutes, the white linen napkins that are embroidered in silver and wrapped in a silver napkin sheath (from Pier One). 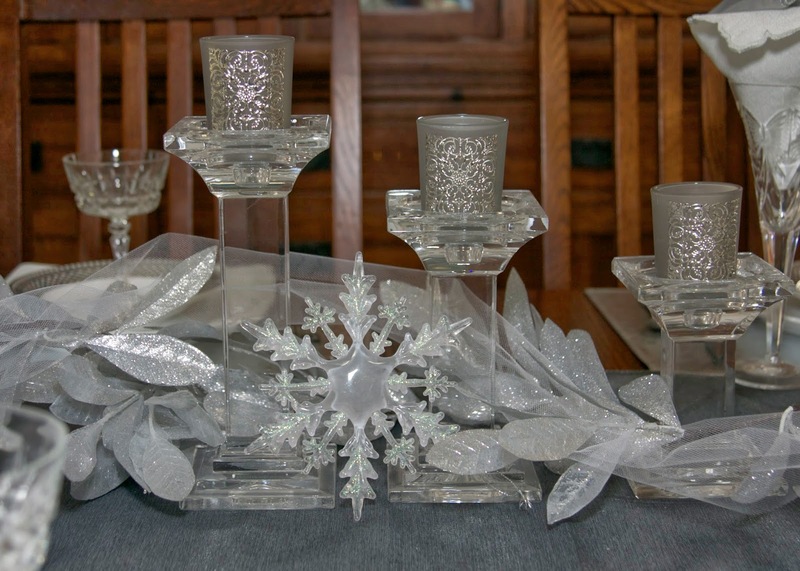 The centerpiece was inspired by my recent viewing of Walt Disney's "Frozen". What a GREAT MOVIE; highly recommended for the grandkids, although the Snow Monster was kind of scary for little ones. But the storyline, music and ending message were terrific. Anyway, I wanted a look of snow, ice crystals and sparkle. 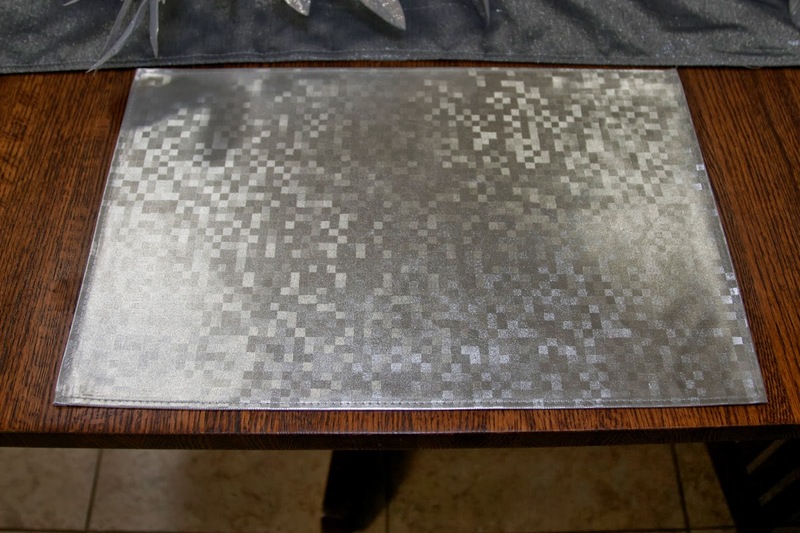 I started with a silver table runner, Christmas gifted from one of my daughters. Then added a silver garland of leaves picked up at the clearance table at Ross. I draped the garland in tulle for an ethereal, cold mist effect. The trio of crystal candleholders is a long ago gift from a dear friend, and I placed silver-embossed votive candle holders also found on that great Ross clearance table! I raided my Christmas tree for the snowflakes! The crystal accents (the tree and nutcracker) were past Christmas gifts from special friends who know how much I appreciate holiday decorations! Wishing everyone a wonderful New Year full of good health and the making of happy memories! Please know I love your comments! And if you want to know when a new post is up, just go to the top of my blog page and fill in your email by "Follow by Email". Gorgeous table! Just love the clock face idea. Sweet crystal nutcracker too. This was a fun Let's Dish. Thank you for taking the time to comment, Pam. It was a fun Let's Dish, seeing everyone's take on decorating for the New Year ! Have a Happy One ! Thank you for your encouraging comments, Dawn. This post was fun to do ! 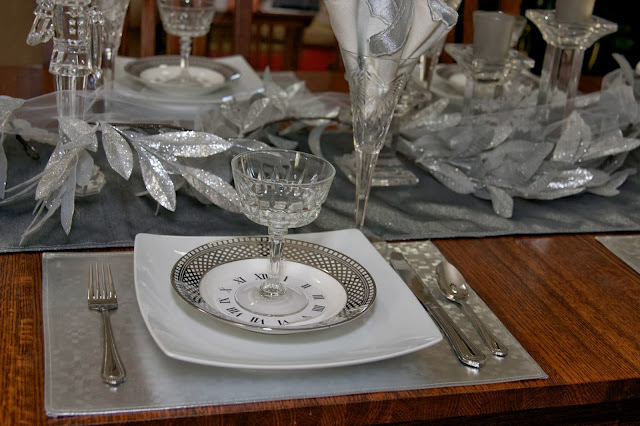 A very pretty tablescape and I love all the thought that went into it especially leaving hands off the "clock" allowing for each guest to think about her own special time. Thanks also for leaving your lovely comment on my blog. Thank you for coming by and taking at look at my blog. Have a Happy New Year! What a great idea to leave the clock face with no hands! I'll bet that was a real hit! Very creative! 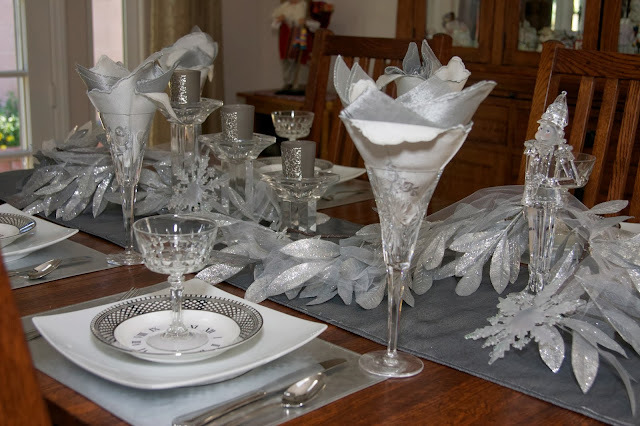 I love all th crystal accents, especially that nutcracker! 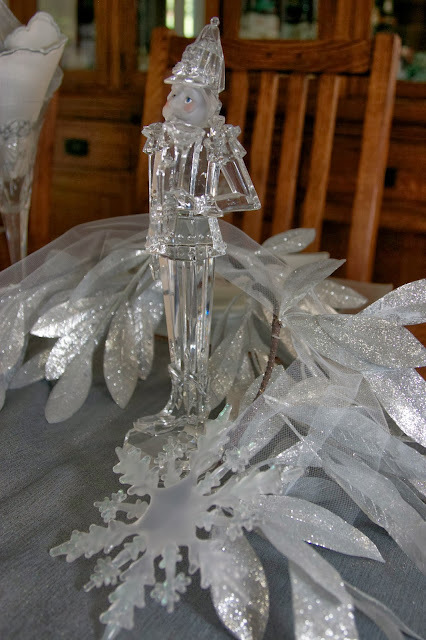 I have never seen a crystal nutcracker in my life, so he really stands out! I went into a Ross store today. We just got there here in the Kansas City area in 2013. I didn't find much there, but I'm not going to give up. 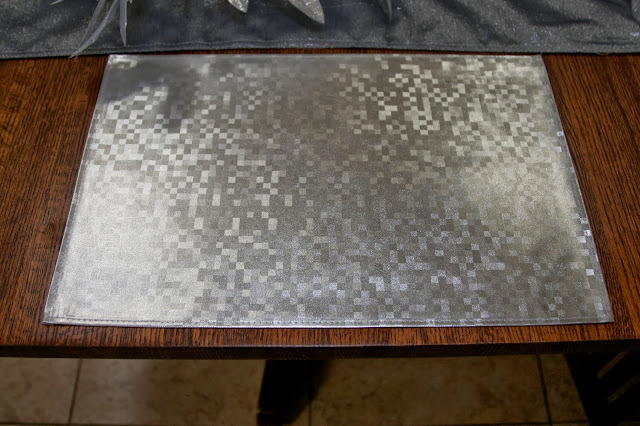 When I see great stuff like the placemats you found, I know I'll hit the jackpot someday! Thank you, Alycia, for visiting and taking the time to comment. "Ross" is like most clearance stores; you have to go in on a fairly regular basis and you're either lucky that day, or not. After major holidays or seasons is when there is the best chance of finding something you might like. But, that "hunt" is one of the fun parts of tablescaping! Have a Happy New Year! This is such a glamourous table! 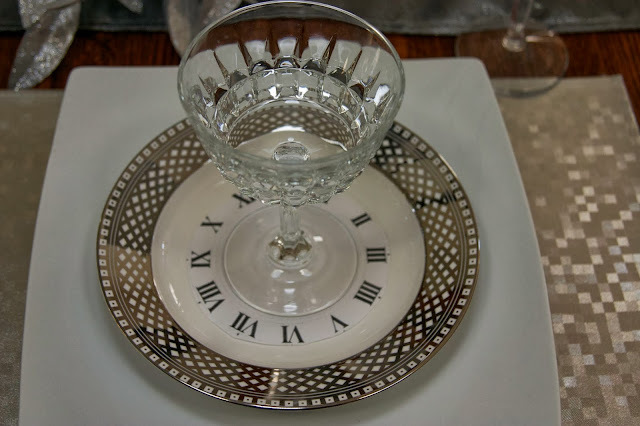 I love the “stack" and those clock plates are fabulous. I’ll look forward to seeing the movie too. Thank you for visiting, Emily. I appreciate your comments. Beautiful, lovely, elegant...not enough adjectives! Love the serene color scheme. Thank you for your kind words, Bev. Have a wonderful New Year! Thank you for your supportive comments, Christine. I hope you enjoy 2014 as well! This is really beautiful -- I love all the silver! Looks very elegant and festive. I'll have to remember to re-use my Christmas snowflakes that way. Thank you for taking the time to comment, Deborah. Have a great New Year! Thank you for your kind words, Candy. I send the same good wishes back to you and your family! Thank you so much for the mention! 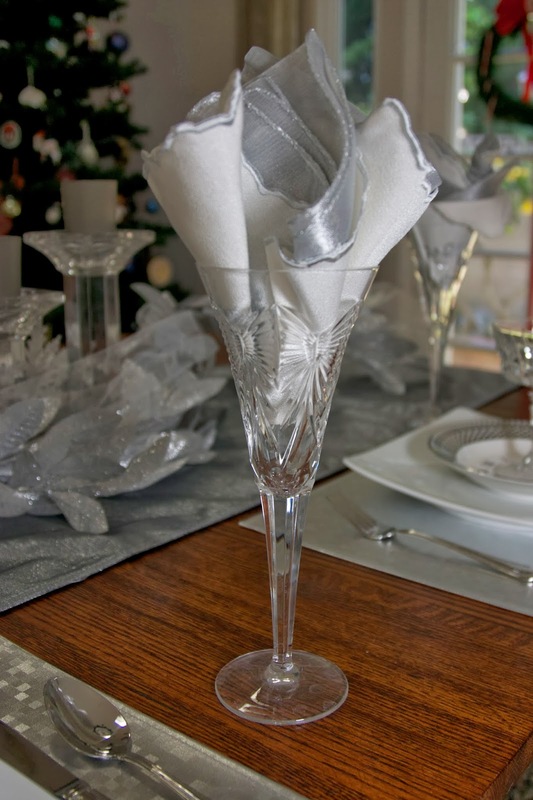 Your tablescape is exquisite! Happy New Year! Thank you so much for the mention! I'm so glad you could use it. 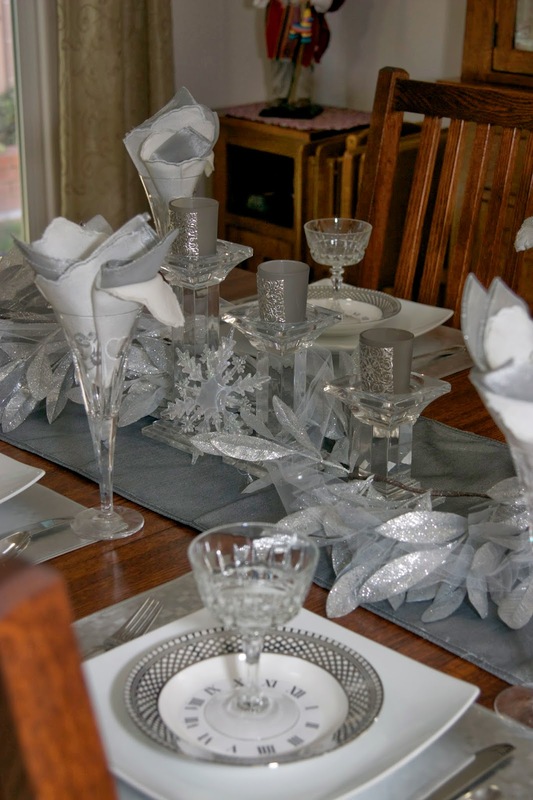 Your tablescape is exquisite! Thank you for taking the time to comment, Sam. I always enjoy checking out your blog! Have a Happy New Year! I just love this! The crystal nutcracker and clock faces are such great touches! Happy New Year!! Thank you for your encouraging words. This was a fun table to do as we start another year! Have a good one!! This is so lovely! 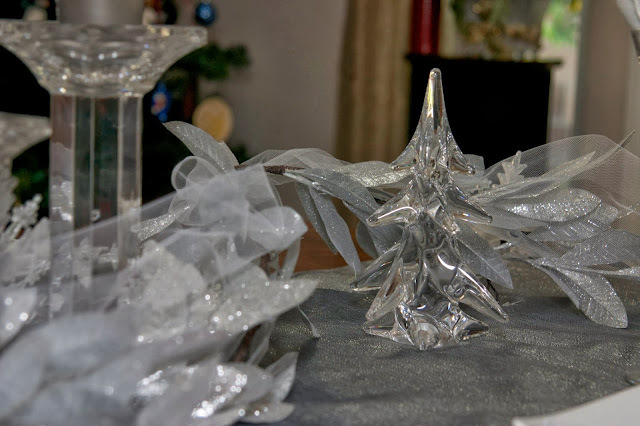 I love the crystal nutcracker and clock face idea! Happy New Year!! Hi Rosie, than you for coming by. Your table is lovely. I adore the china pattern. You have glammed up this table with so man y pretty items. Love the crystal! 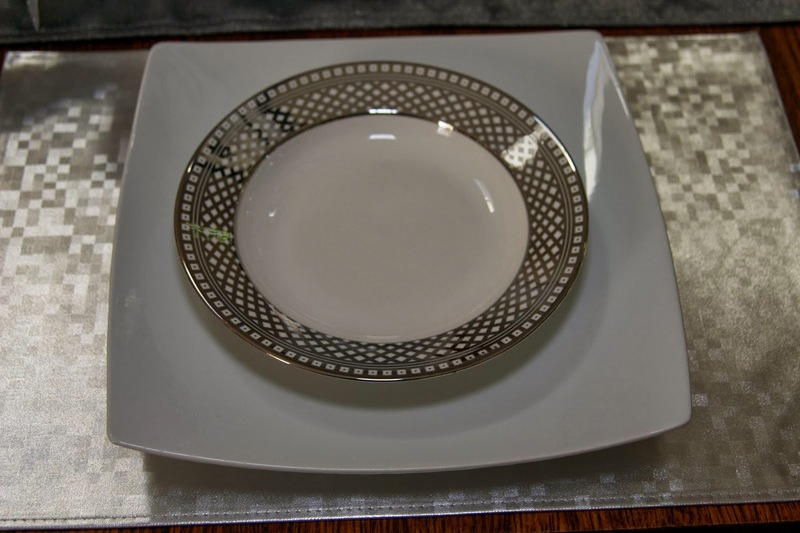 As for my crown dishes, I found them online at Amazon. Happy New Year to you.